This new version of "Winterborn" was inspired by the incredible macro-photography of Alexey Kljatov. 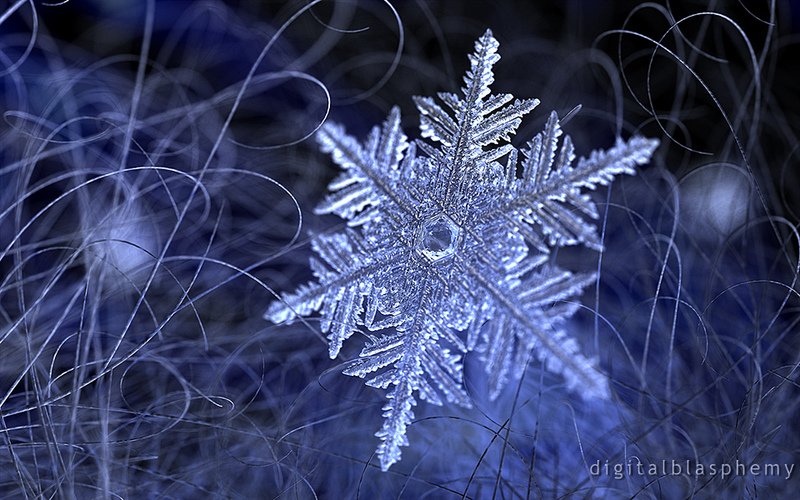 I used one of background ice crystals from the 2012 revision which all modelled using Incendia's Snowflake modeler. This particular flake was created when I was showing my son Jason how to do back when he was 6 years old (the shading is the hard part). I created the threads in Xfrog and rendered the whole using Lightwave 11. 10/10 in my book. I LOVE snow, living in the Southwest we don't get much. This one took my breath away though. Instant favorite. Thank you so much for all of your hard work. I wouldn't change anything. I hope to see a 1920x1080 version. I love everything about this picture. Literally don't think it can be improved on. Well, this one's another ten, Mr. Bliss. I didn't really wanna see it, seeing as how in West Michigan, we've had a crapload of snow the past two weeks. A green Xmas, then...DUMP! But your picture is beautiful, sir. It gives us pause... how such a delicate thing, so pretty and practically weightless, can, when they gather in hordes of trillions of trillions, bring mankind to a standstill by clogging roads, downing power lines, shutting people in, etc. So, it's always nice to see the positive side of that snowflake. Thank you once again, sir. Well, this one's another ten, Mr. Bliss. I didn't really wanna see it, seeing as how in West Michigan, we've had a crapload of snow the past two weeks. A green Xmas, then...DUMP! But your picture is beautiful, sir. It gives us pause... how such a delicate thing, so pretty and practically weightless, can, when they gather in hordes in trillions of trillions, bring mankind to a standstill by clogging roads, downing power lines, shutting people in, etc. So, it's always nice to see the positive side of that snowflake. Thank you once again, sir. 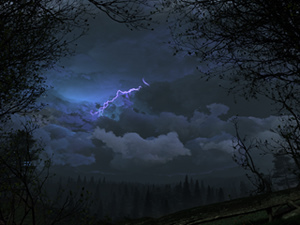 It is really nice but the 3200x1200 dual 4:3 download is bad. It is like a thumbnail size. Can't wait to see it full-size dual screen. I liked the FB render much more. That is where I first saw it. The FB version had a cylinder shaped flake and didn't have the whispy background. The flake looked like an ankh and was very unique. "My wallpaper at the moment"
I love this design. Your work is always so detailed. Each little pixel so intricately placed. Well done! Love the flake, not so sure about the background. Still a lovely update. This is a very pleasant way to start the new year! ...no 1440 x 1280 (Nexus 7) though? So happy you were inspired by the macro-photography of Alexey Kljatov. The first time I saw his images I was in awe! Now it's like the best of both worlds in your wallpaper! Thank you so much, Ryan. This is so beautiful!!! Love this render.